There was light. But then what happened? How did life arise on the third rocky planet orbiting the unremarkable star at the center of our solar system? Humans have been wondering about the answer to that question probably almost as long as we've been able to wonder. In recent decades scientists have made some gains in understanding the conceivable mechanisms, gradually settling on a possible picture of our origins in the oceans. The idea was that hydrothermal vents at the bottom of the seas, protected from cataclysms rending the surface four billion years ago, delivered the necessary energy and could have sustained the molecules needed. Perhaps not. Water was a necessary ingredient, surely, but that doesn't mean we sprang from oceans, according to researchers Martin J. Van Kranendonk, David W. Deamer and Tara Djokic in our cover story, “Life Springs.” Oceans, they write, might have spread the needed molecules too quickly for cell membranes and functions to occur. Instead they argue, land pools in an active volcanic landscape that repeatedly dried and got wet again could have cradled the seeds of life. How could something that sounds so harsh have been beneficial, you ask? Read the article to find out. The sun's rays provided vitality for this world. Seeing them dim temporarily, as they do during a solar eclipse, is awe-inspiring. It's been nearly a century since a total solar eclipse has crossed the U.S. from coast to coast. You'll find that “The Great Solar Eclipse of 2017,” by Jay M. Pasachoff, tells you everything you need to know about this rare event. And a companion piece, “1,000 Years of Solar Eclipses,” by senior editor Mark Fischetti, with illustrations by senior graphics editor Jen Christiansen and designer Jan Willem Tulp, tells you what you will need to know as well. 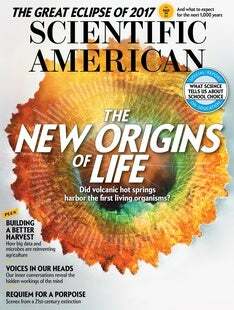 I like to think that the readers of Scientific American, which turns 172 this month, will be enjoying the solar shows well into the future. If they do enjoy them, it'll be because we've fostered a love of learning about the world around us. How we teach and create the right learning environments are critical to our students' success. For that reason, we've taken an evidence-based look at the concept of vouchers in education in “A Matter of Choice,” by journalist Peg Tyre. The concept is a keystone of the current administration's plan to revamp education, but research finds it wanting. Fortunately, there is still time to make a choice.